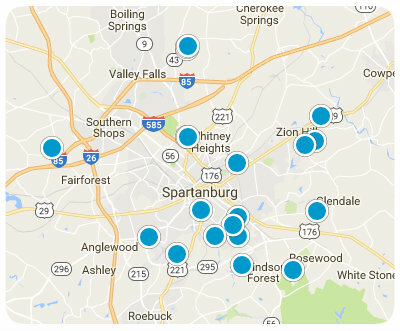 Located in Spartanburg District 6 and offers the home buyer more up-to date ranch style homes on large lots priced in the 200’s. Woodlands at Autumn Glen is a brand new part of this neighborhood with new construction still going on today. Homes start at $150k. A HOA fee is charged for both neighborhoods for street light maintenance. Located in a rural setting, but yet still close to interstates for the ease of shopping, restaurants and more.